The Cape Town Jazz Festival is Africa's biggest jazz music festival. This major event on the Cape Town event calendar takes place annually at the end of March. In its 15th year, the festival will offer amazing concerts of more than 40 renowned local and international artists. For the two day festival from 27-28 March more than 37,000 visitors are expected to join in the vibrant atmosphere. Again this year, a free community concert will be held at the Greenmarket Square before the start of the Jazz Festival. The annual Cape Town International Jazz Festival (CTIJF) FREE community concert, is set to be a vibrant mix of local and international artists. 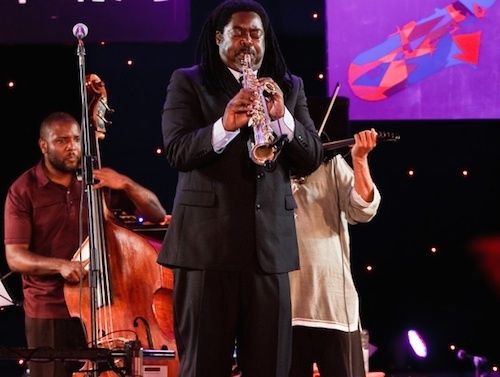 This year, multi-instrumentalist Courtney Pine from the UK will join South Africas jazz great, Sipho Hotstix Mabuse, on stage to entertain the crowds who will throng Greenmarket Square. Joining the illustrious pair will be the winner of the popular local Open Mic Jazz Vocal competition, Zoë Modiga, Cape Towns very own pop group Beatenberg as well as the All Star Band. According to Western Cape Premier, Helen Zille: 'The festival has become one of the main events in the city's calendar.' It's a great opportunity to experience our rich diversity in the arts & music. I want to encourage everyone to take this opportunity to attend & share in this experience. Free transport to this free concert is provided by PRASA, the Passenger Rail Agency of South Africa, who is the official sponsor of the CTIJF will provide free trains on selected main lines. The following routes will operate free train services departing between 15H00 and 17h00 and returning from Cape Town at 23H30.